I’m not going to lie, I was scared to take Ke’alohi to the pool. I was so worried that she wouldn’t like it just as she hasn’t liked the beach. 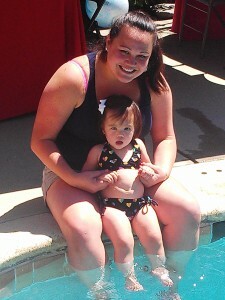 While we were at Kamauliola’s birthday party, we decided to try the pool out and see if she liked it. To our surprise, she loved the water and had a ball splashing the water with her feet and bouncing around in and out of the water. Doesn’t her bikini look adorable? Love the bathing suit! She looks adorable! This weekend we took Doris Kometani and Chris Akina’s son, Zachary to the pool for the first time… he HATED it initially, but after his mommy and daddy (along with his Aunty Jasmine) jumped into the water to play with him, he LOVED it… he’s definitely the tannest baby at his daycare now. on this website, bookmarked!You have very worthwhile points. What a fantastic site you might have here. Hello there, your website is really good. We do appreciate you great posts. to come back later. All the best.